Photophobia is the word used to describe the symptom of eyes sensitive to light. If you have photophobia, when exposed to light, your eyes may become watery, experience a sharp pain, and your eyelids will squint. Photophobia can be mild, moderate, or severe. As a Low Vision Optometry Clinic, we are equipped to help you with your photophobia. 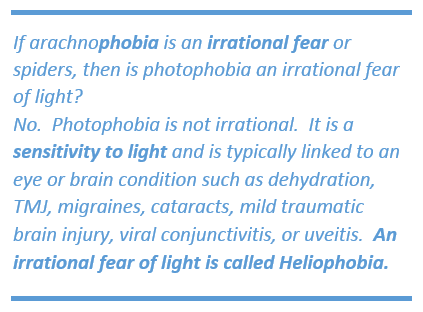 Just because you have photophobia does not mean you have an eye or brain disease- it can happen on its own (known as Idiopathic Photophobia). This is common. Mild photophobia is more common in light eyed individuals. Severe photophobia is often related to an eye condition or disease. What can I do to Improve Photophobia? Tinted Eyeglasses & Tint/Transitions Combo Lenses Your normal eyeglasses can be tinted. Experiment with different shades and colors with a low vision optometrist. Get a doctor�s note to wear sunglasses indoors your workplace or school. Combine indoor tints with transitions so that your glasses get even darker outside. Cocoon and NoIR Sunglasses These are two brands of sunglasses that are made to fit over your regular glasses and provide you with complete sun protection, even from the sides. Lamps adjustable brightness To adjust the brightness on your home lamps is important for managing your condition. Also buy outlet extensions and wall switches that are adjustable and may work with your regular lamps. Hydrate and Rest During episodes, dehydration can exacerbate your symptoms of photophobia. Drink plenty of water and get plenty of rest during an episode of photophobia. Turn Down Phone & Laptop Brightness Most phones, tablets, and laptops have a brightness setting that can be changed. For help, bring the device to the electronics store or to your Low Vision Optometrist for help. Lamp Shades To cut down on glare, always use lamp shades instead of exposing you directly to a light source. Occupational Therapists are trained to help you design your home living conditions. Can A Doctors Note Allow me to Tint My Car Windows in California? An eye doctor can provide you with a note stating you have photophobia and requesting your employer or school to make accommodations. However, California law requires you to use additional shades and tints that are easily removable and should be removed at night. You cannot have your windows permanently tinted to protect your eyes from the sunlight, even with a doctor�s note. Other states laws may differ. See below for the exact wording of California law. California Law VC � 26708(a)(10). "Sun screening devices meeting the requirements of Section 26708.2 installed on the side windows on either side of the vehicle's front seat, if the driver or a passenger in the front seat has in his or her possession a letter or other document signed by a licensed physician and surgeon certifying that the person must be shaded from the sun due to a medical condition, or has in his or her possession a letter or other document signed by a licensed optometrist certifying that the person must be shaded from the sun due to a visual condition. The devices authorized by this paragraph shall not be used during darkness." California Law VC � 26708.2. "Sun screening devices permitted by paragraph (10) of subdivision of Section 26708 shall meet the following requirements: (a) The devices shall be held in place by means allowing ready removal from the window area, such as a frame, a rigid material with temporary fasteners, or a flexible roller shade."